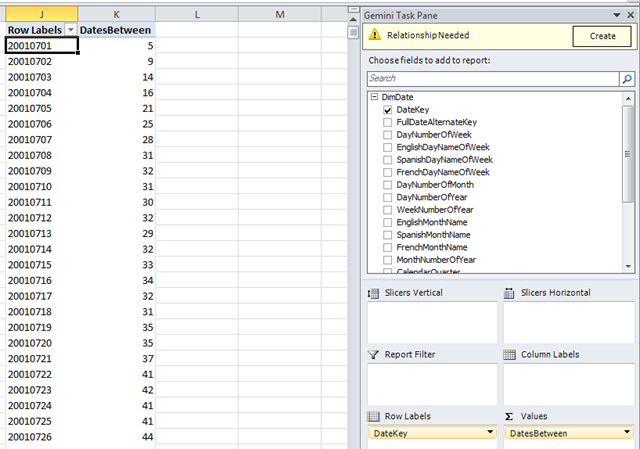 The first thing to do in PowerPivot is, obviously, to import the DimDate and FactInternetSales tables. 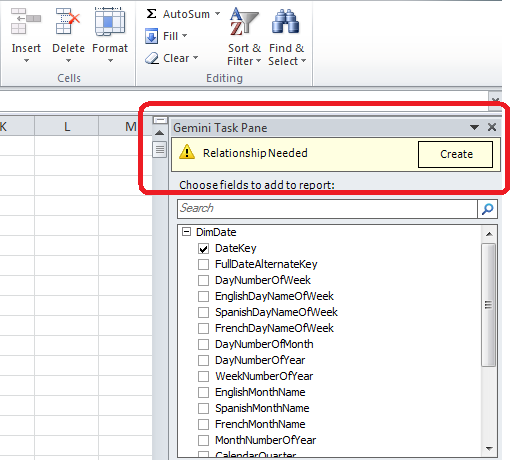 However the next step is less than obvious: you must not create a relationship between the two tables. Even though PowerPivot suggests you should, you won’t get this solution to work if you do – and as a result, in my opinion, it would be great if this message could be turned off (vote here if you agree). 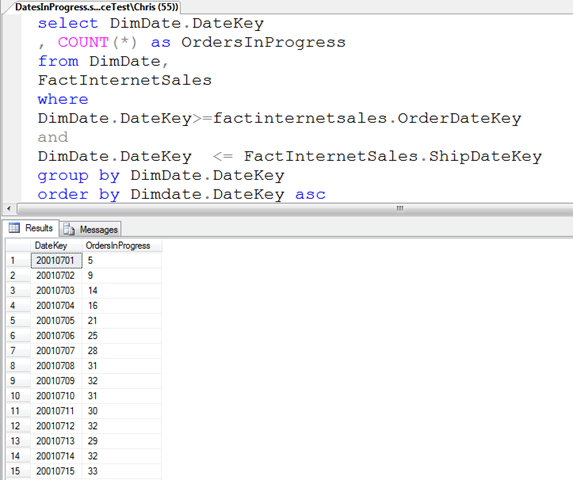 The next problem is that this only works when something is explicitly selected from DateKey. When you put Calendar Year on rows or columns though, for example, it returns nothing. I’m currently working on getting this fixed, but that will be another blog post! Anyway couple of questions need to be asked at this point. First of all, how/why does this work? Well Marco has just posted a great explanation of the Calculate statement here that I recommend you to read and reread; it covers the theory behind this expression and a lot more. Secondly why is this second expression so much faster than the first? Here’s what Marius told me: in the first expression the filtering is done on each individual row in the fact table. In the second expression the filters act on the distinct values from both OrderDateKey and ShipDateKey, and since the number of distinct values is smaller than the overall number of rows this is evaluated very quickly; the results of these two filters can be then used in a further, very efficient request to the PowePivot/Vertipaq engine. In Marius’ own words, the takeaway is that “it’s always a best practice to avoid filtering an entire table if the filter condition involves only some of the table columns (i.e. when no key/unique columns are used in the condition expression). 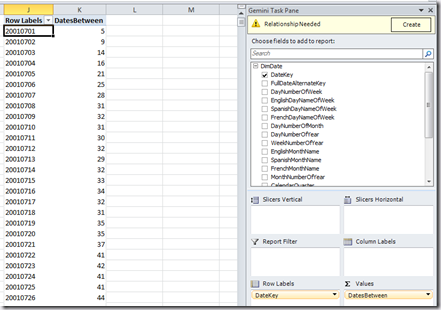 The way to go is to only filter the columns involved in the condition (using Filter over All, Values or Distinct applied to the desired columns), and use those filter results as parameters to Calculate to carry out the rest of the computation”. Note that this isn’t a matter of block computation vs cell-by-cell because all calculations in DAX are evaluated in block mode. So there you go, the first DAX optimisation tip on this blog!